Rent villas and apartments in El Raso, Spain with private pools. Book affordable holiday rentals that are near a beach and golf course. Beautiful villa 5 mins from beach in quiet residential area. Close to lovely Spanish town of Guardamar. 10 min from Torrevieja. 25 mins from Alicante Airport/ 25 mins from Murcia Airport. This charming holiday home with cosy interior is perfect for families as well as who want a longer stay. The house has a nice outdoor area as well as a balcony which is perfect for outdoor dining. 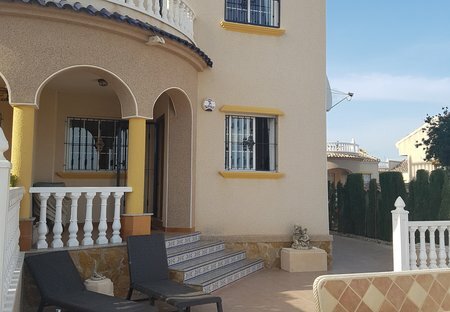 Elegant and quiet holiday apartment in Guardamar del Segura on the Costa Blanca. The apartment is located in the urbanization El Raso, one of the best facilities in the area with 2 community pools. Beautiful villa with private pool, 3 double beds with lovely furnishing's through out and areas for relaxing and sunbathing with sun all day. A lovely villa all year round to visit, tour & relax.